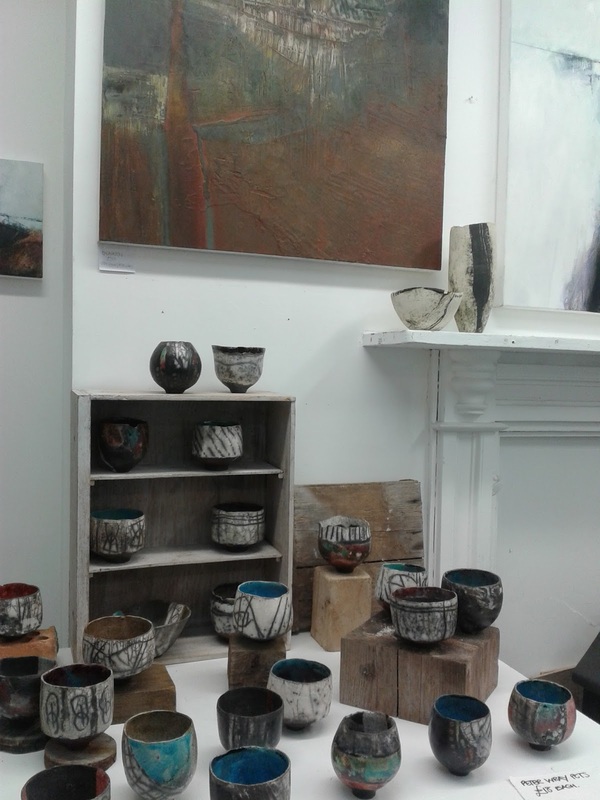 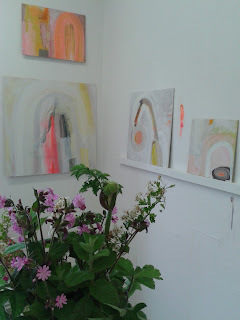 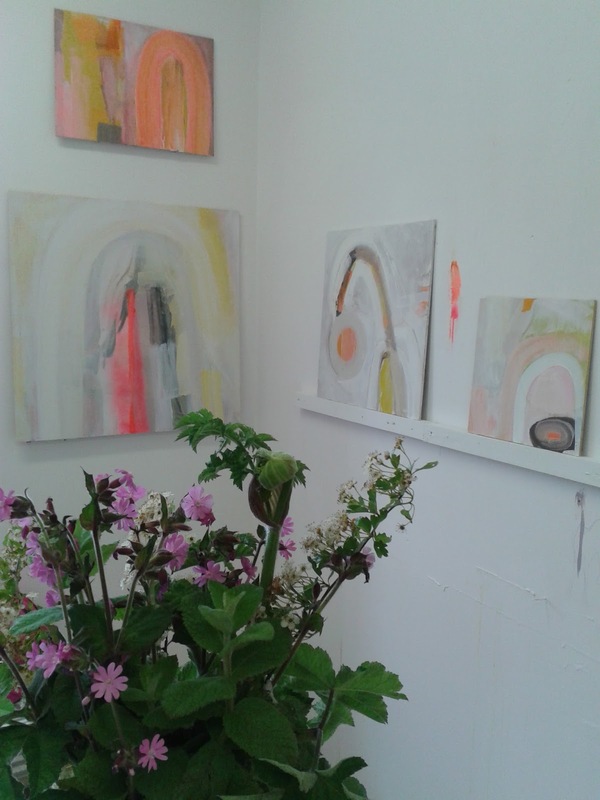 Yesterday was a busy day trying to see as many Open Studios as possible!!! 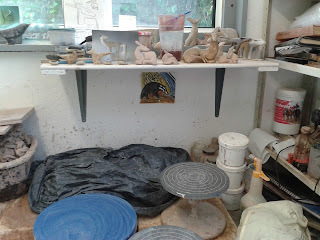 Firstly we made a stop to visit Gary Rogers at High Bussow Studios (Glinary Pots)...more on that in a separate post later.... Our next stop was Trewidden Gardens (didn't have time to check out the gardens themselves but another day...)where there are some great studios with several artist's we particulary wanted to see. 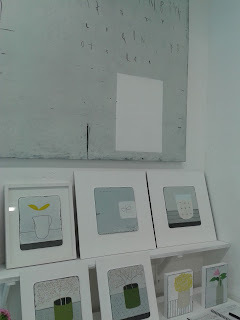 I thought I had picked up a card for this artist but I don't seem to have any details...? 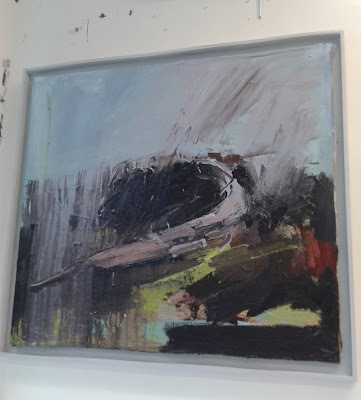 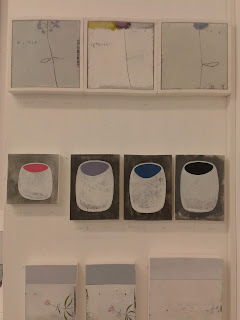 I can't find info in the Open Studio booklet either so if any of the artists could let me know the name???? 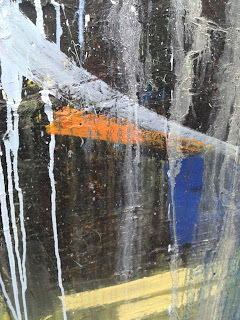 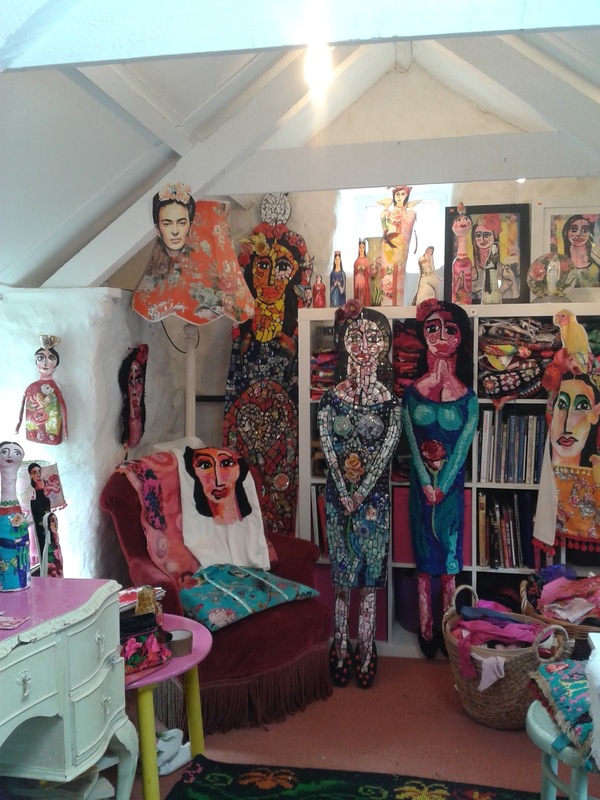 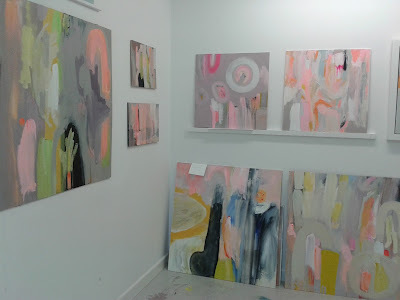 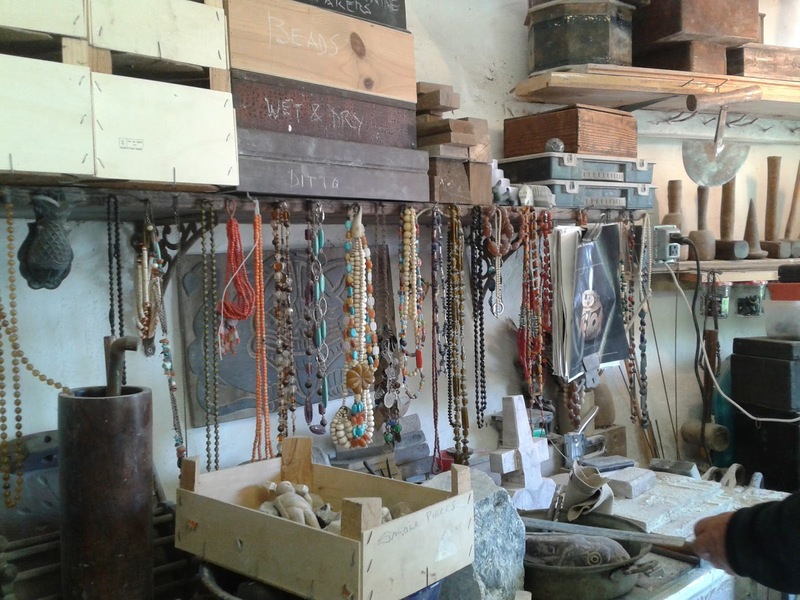 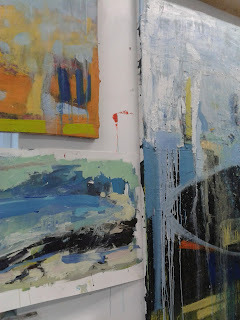 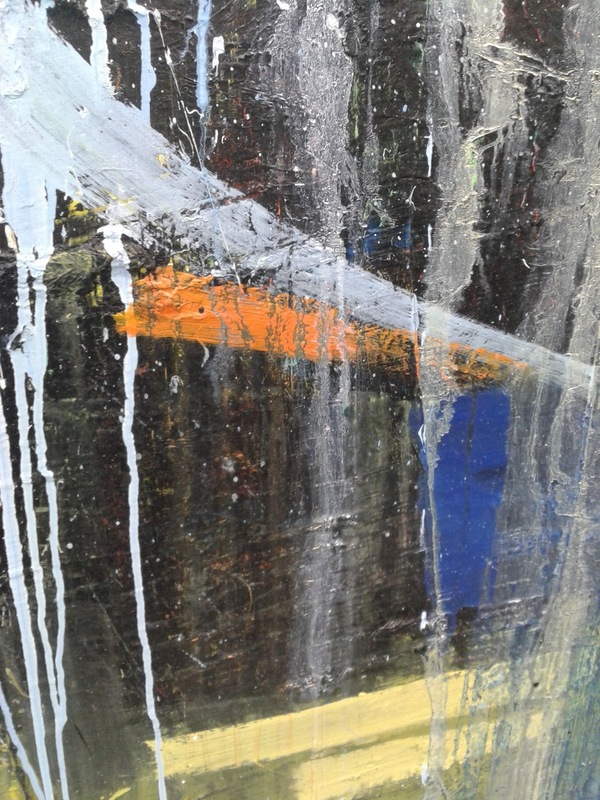 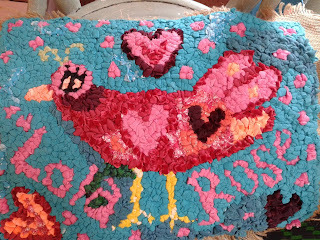 Paul Wadsworth's studio was a riot of colour & texture. 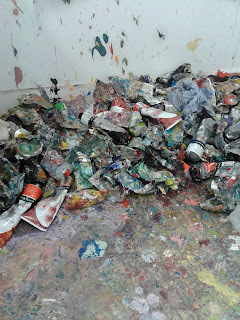 The work is very free,exciting & expressive. 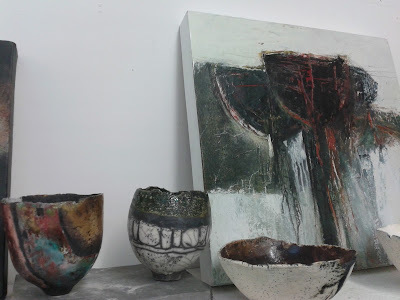 Paul runs courses which I am tempted to try myself just to see if I can loosen up within my own work? 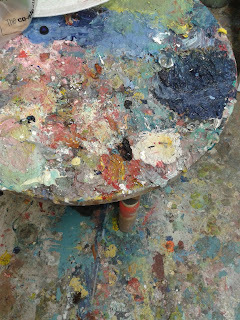 Many layers of paint on this table! 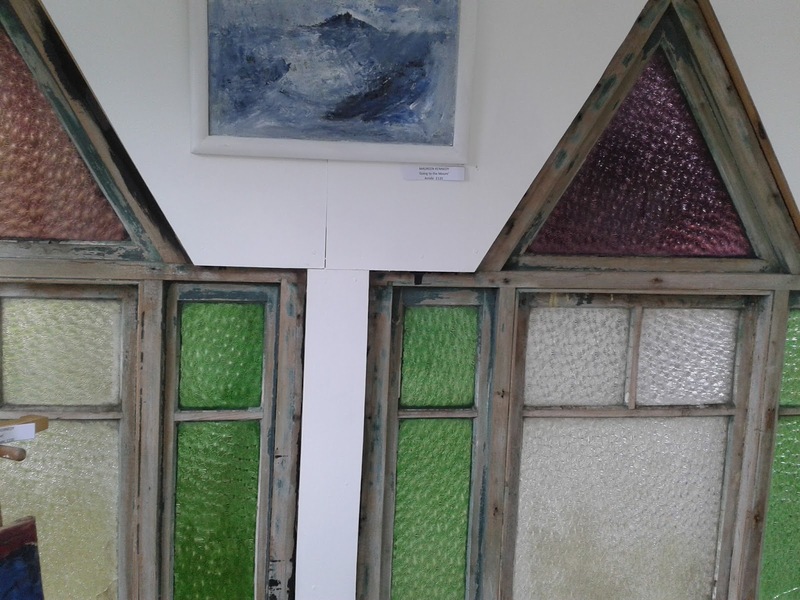 Another vibrant splash of colour was the work of Sophia England whose work has connections with nature & journeys. 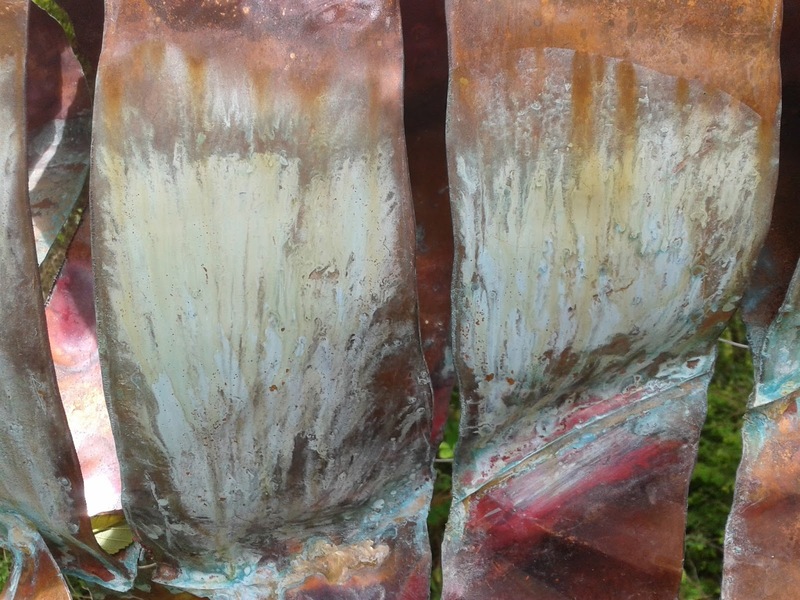 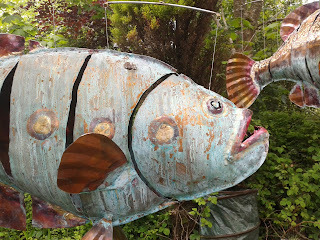 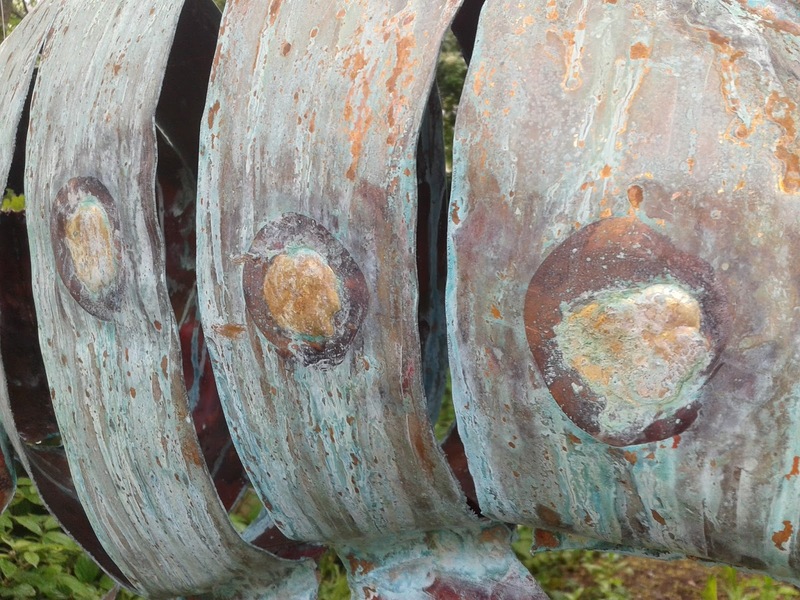 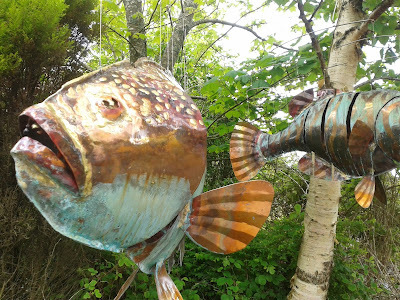 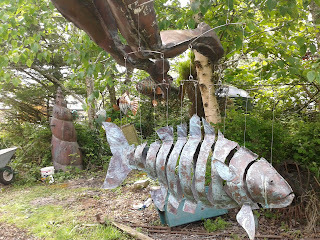 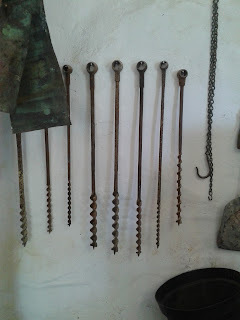 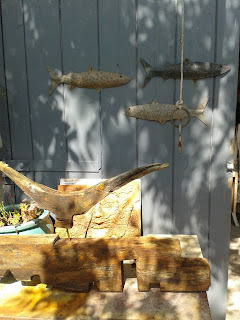 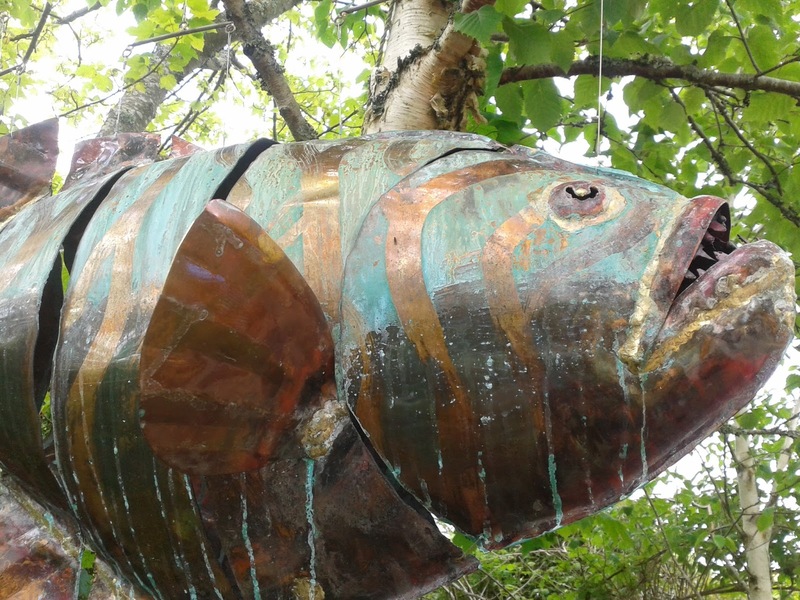 These fantastic fish were there to greet us gently moving in the breeze, articulated copper pieces with beautiful patinas..The work of Michael Chaikin his website has some great videos examples of moving sculptures. 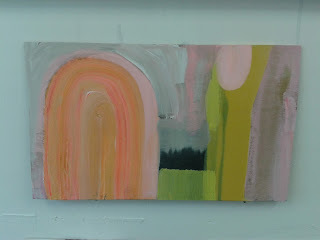 Of all the artists we have seen the past 2 Sundays this was Tim's particular favourite work. 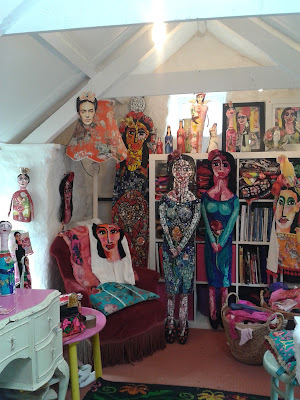 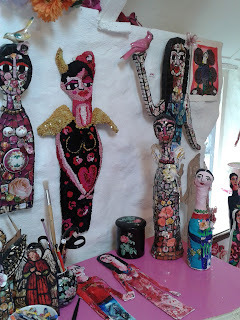 Then it was the turn of another highlight for me...Susie Chaikin creates colourful, eceltic mosaics, textiles & sculptures from an Aladin's cave of jewel like colours. 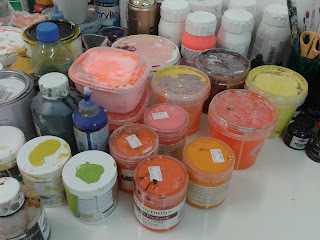 It was like being in a sweet shop! 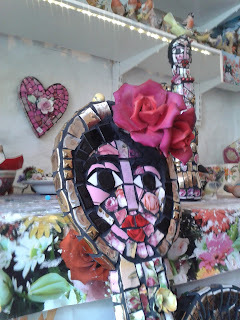 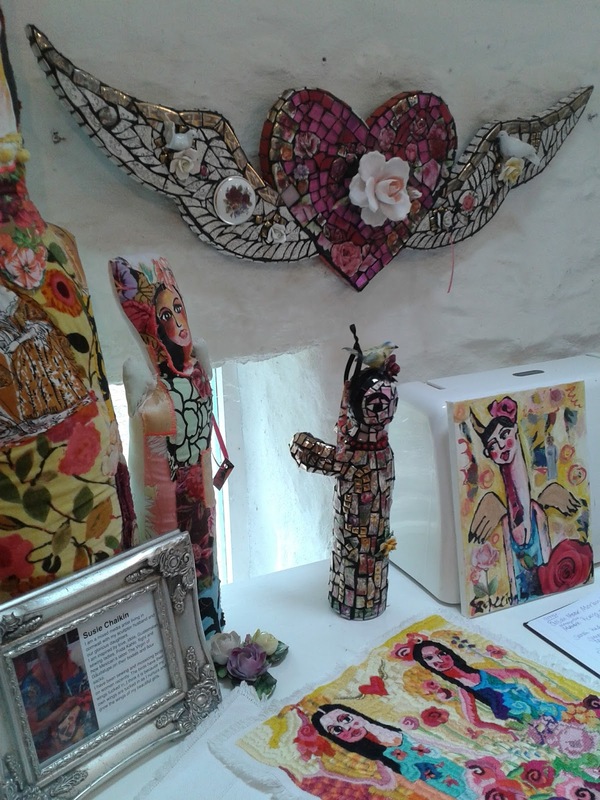 Inspired by Frida Kahlo, Mexico & idols...with regular visits to car boots to collect the wonderful ceramics she incorporates into the pieces. 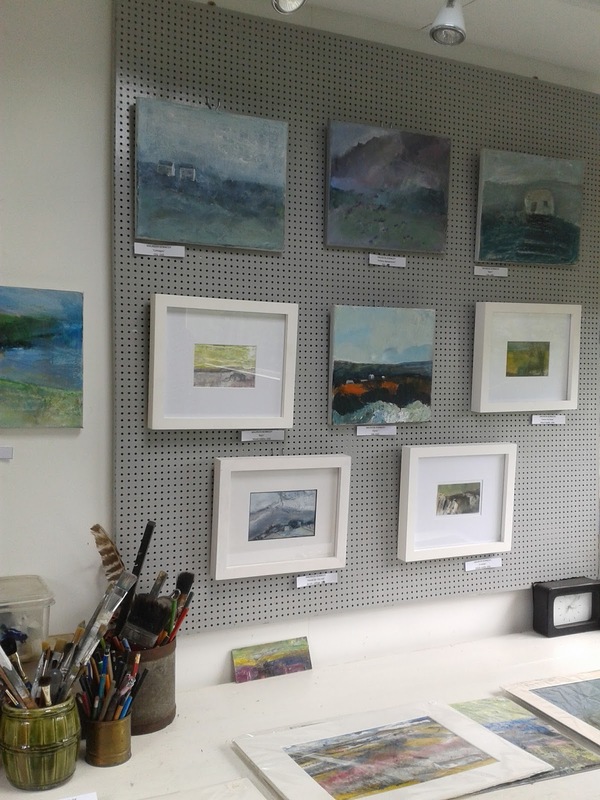 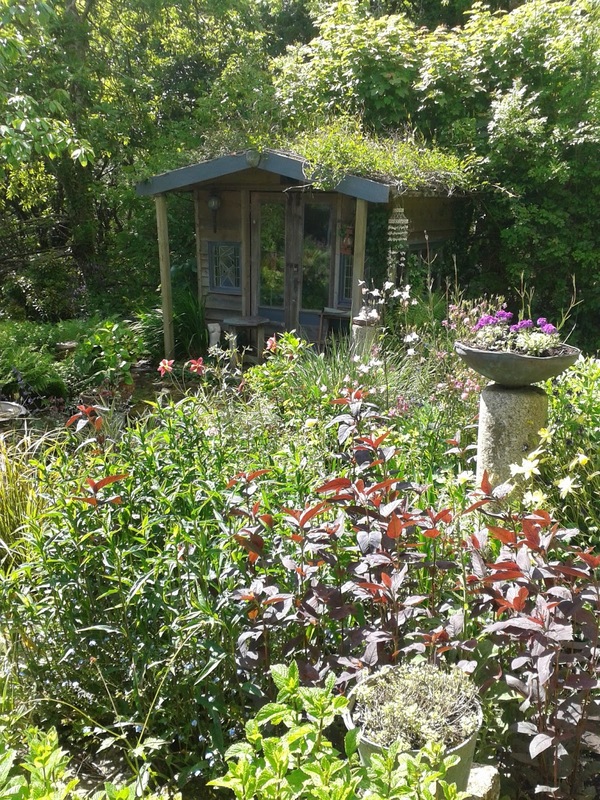 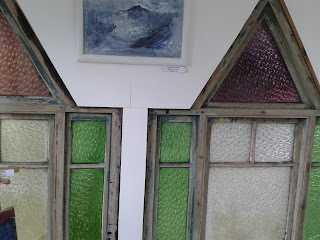 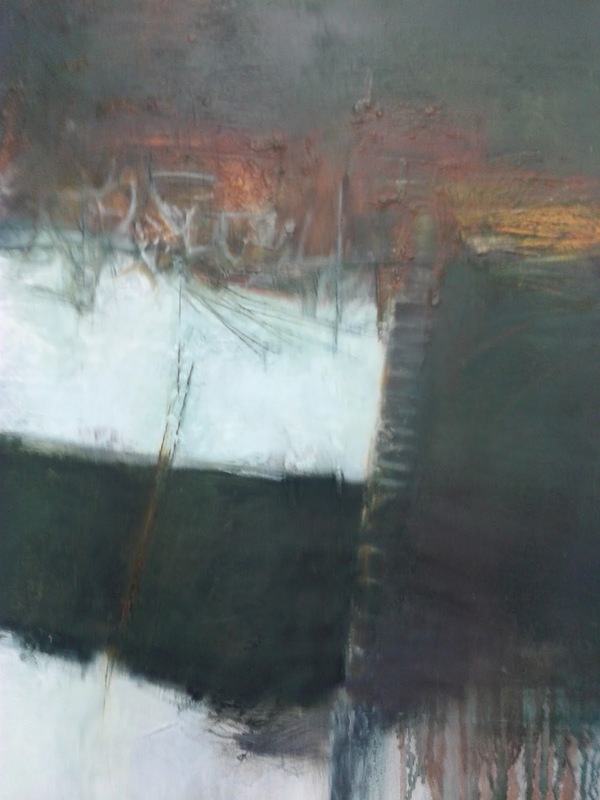 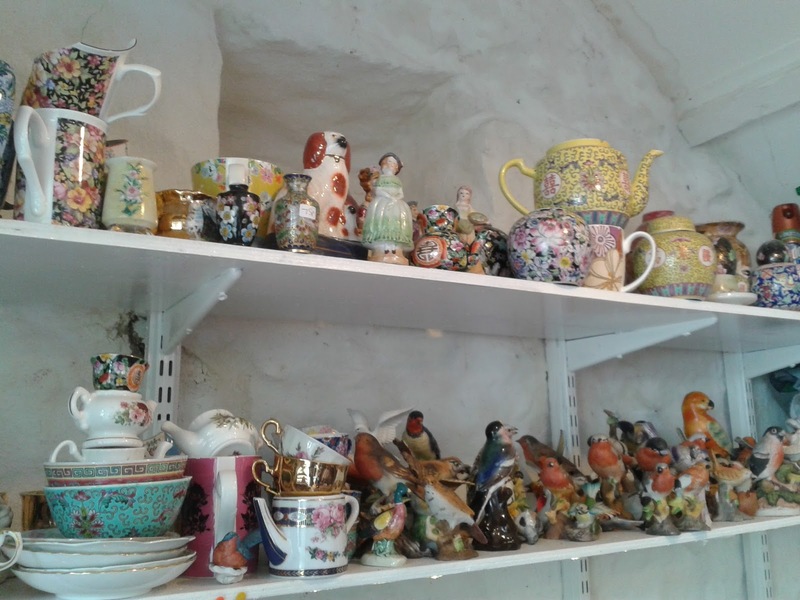 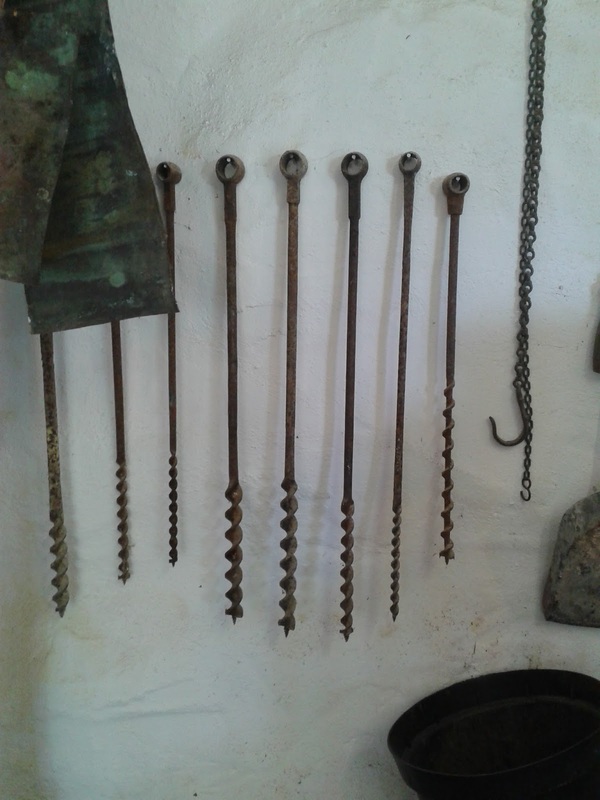 Next was Lamorna area to visit Stephanie Cunningham - we are already lucky enough to own a couple of her wonderful pieces & it was great to see her working studio space & beautiful garden. 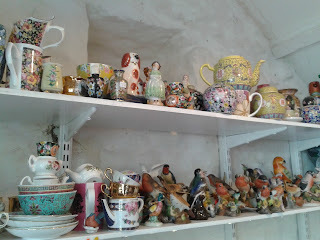 I've got my eye on that badger to add to our collection! 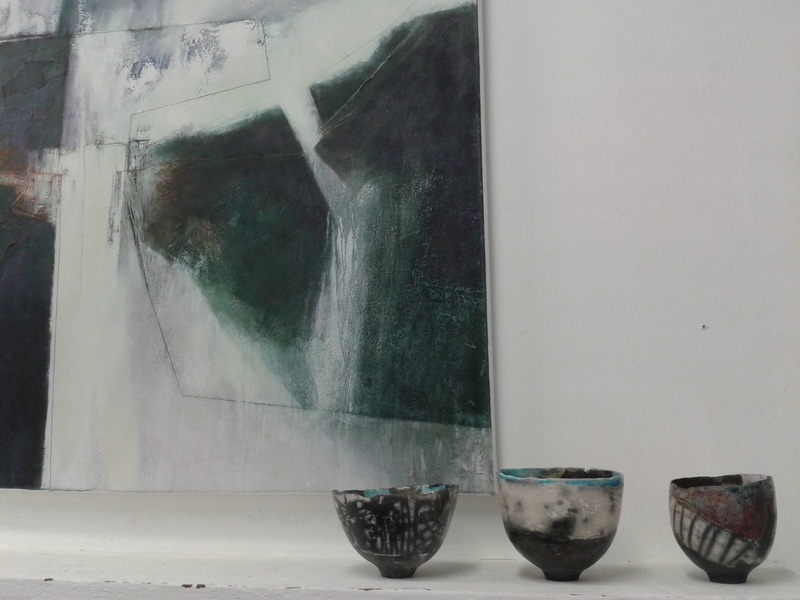 She will exhibiting at the Cornwall Design Fair again this year so I will see her there. 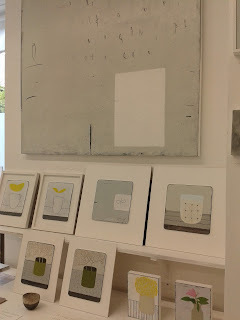 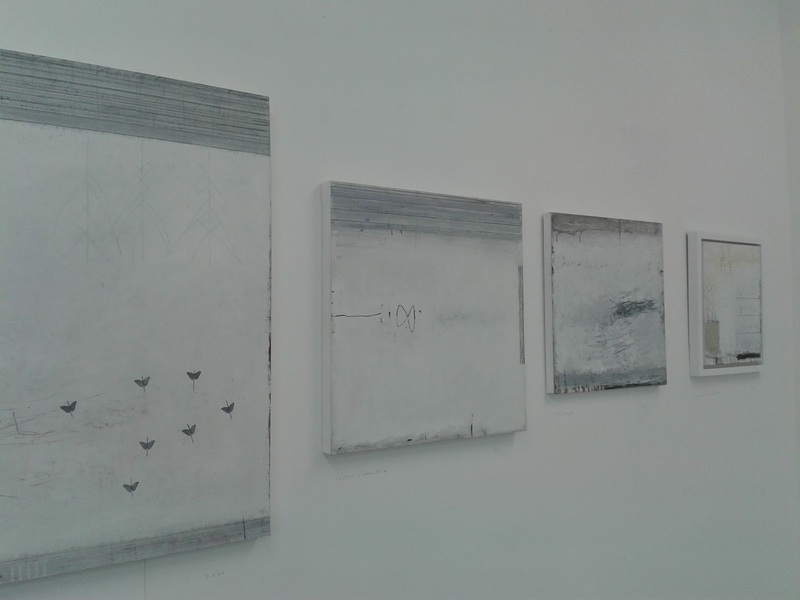 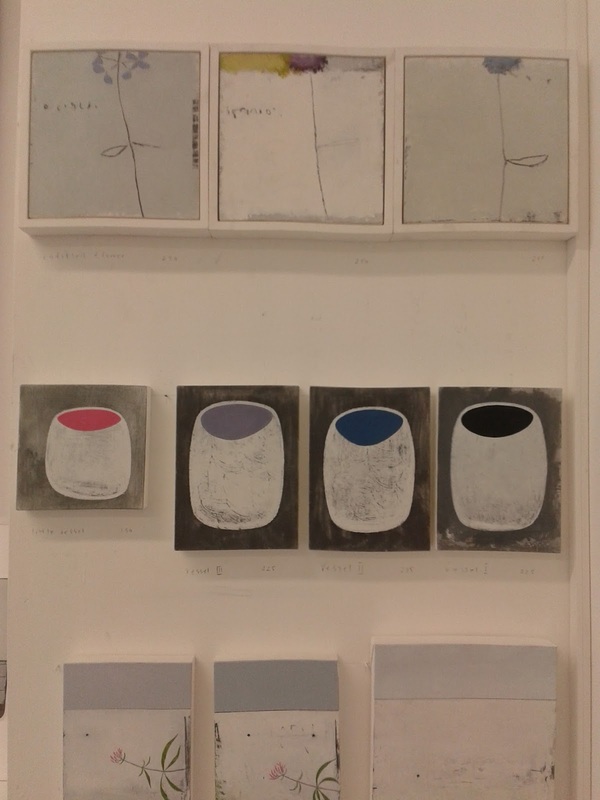 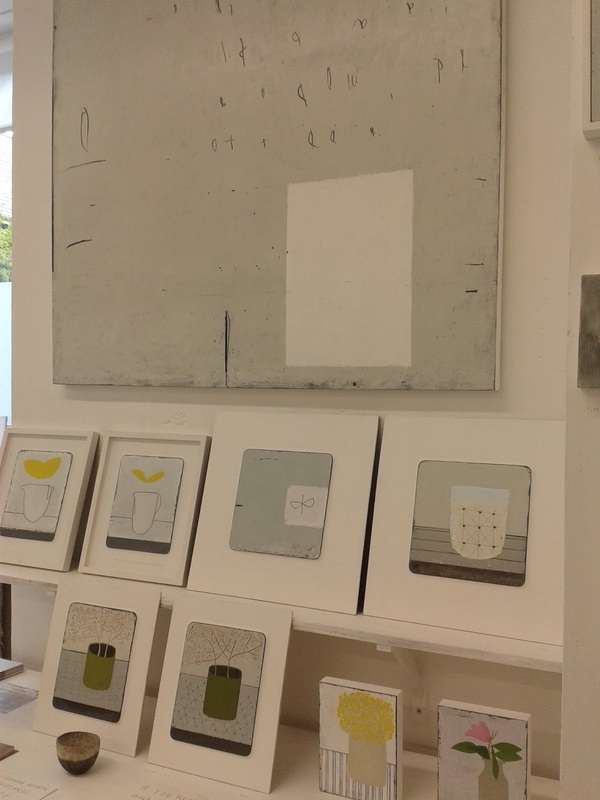 Near by was the work of Maureen Kennedy....with a calm lovely display of drawings & paintings - very tempted! 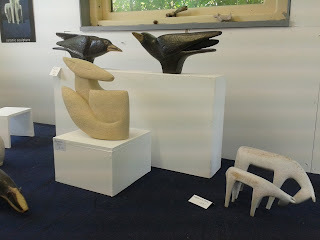 Baz Mehew carves stone such as serpentine & alabaster...we had serious workshop envy here with everything so well organised & taking on a beauty of it's own. 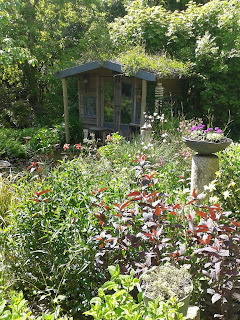 Baz was very generous too showing us around the garden & various constructions plus gave us some rhubarb to make a delicious crumble later. 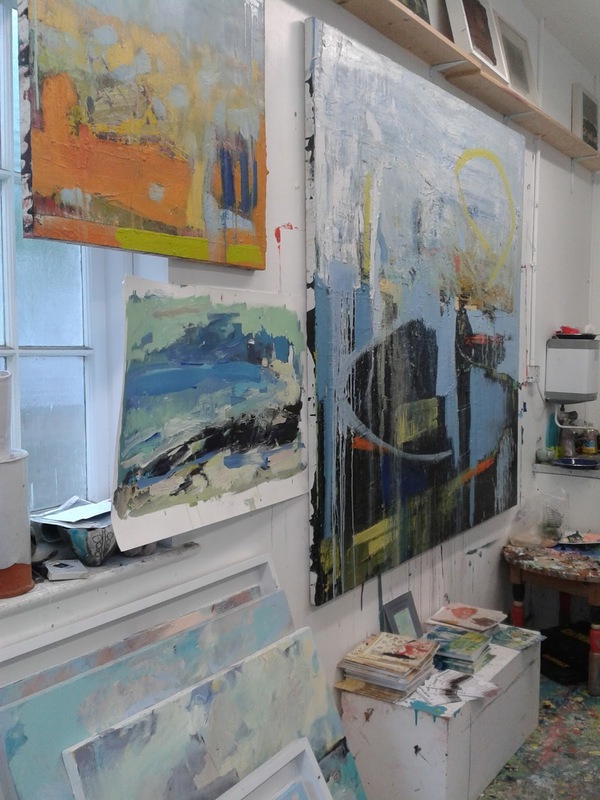 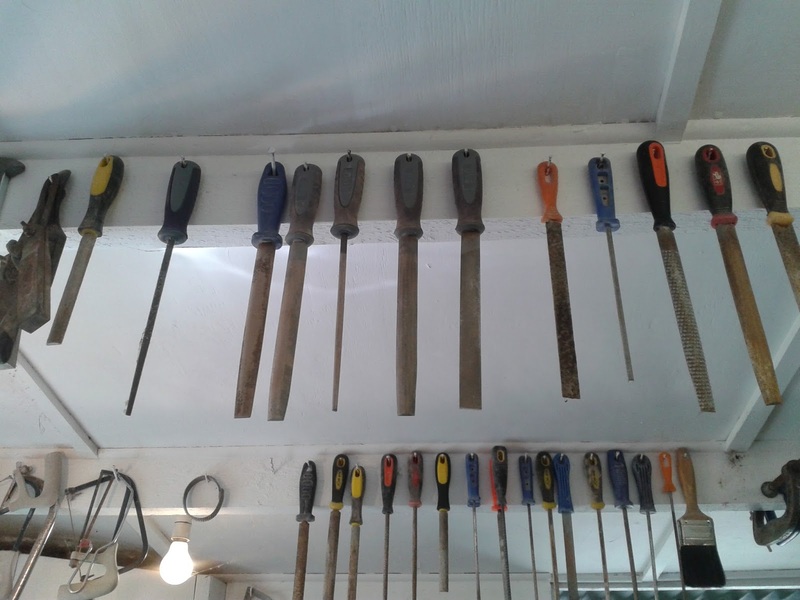 It was a great way to spend a Sunday - very inspiring to see other artists & makers studio spaces & to chat about their work. I will probably take part myself again in 2016 as I would like to show every other year.